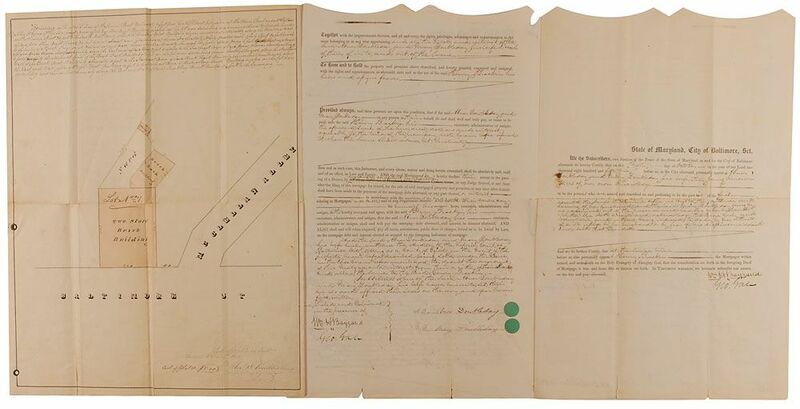 Partly-printed DS, three pages on two adjoining sheets, 10.75 x 16.5, October 5, 1852. 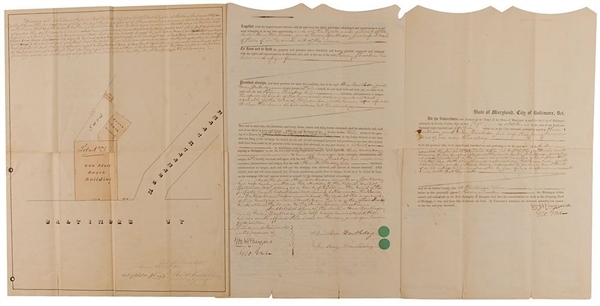 Indenture document between Doubleday, his wife Mary, and Henry Brackin, for the sale of the Doubleday's property in Baltimore for the sum of $600 with the document providing detailed information about the property and the transaction. Also included is a surveyor's plot of the property owned by Doubleday and his wife, 16.5 x 13, giving an aerial view of the land at the corner of Baltimore St. and McClellan Alley. This plot includes measurements of the property as well as measurements of buildings on the grounds. Survey also bears a written description of all pertinent details about the property. Survey is docketed on the reverse and signed at the bottom by the surveyor, Alexander J. Bouldin. In very good condition, with a complete separation of the document’s central horizontal fold, a few other small separations along intersecting folds, pencil notations next to signature, a repaired tear to reverse, and scattered toning and creasing.